Note: When I started this, I just initially intended to rant a little bit and then go back to tending to Sprout, mainly because I know that people who are invested in their right to say nasty things about black women aren’t going to be swayed by anything written by a black woman. That being said, I didn’t write this for them – I wrote this for the woman who is tired of hearing the same myths I hear, often being said to them while they’re working out, and wants a way to respond to that. This is for you. The study is questionable, but the fact that Black females generally do not exercise in the same numbers and intensity is a truth. The problem lies not in the hair, but in cultural norms/expectations/body acceptance. White and Asian women are shamed from early youth when we show signs of being overweight and as we (I am White) get older, our ability to attract men is more restricted and our self-esteem lowers. In Black and Latina culture, there is not the same level of body shaming. A Black/Latina female can still attract men in her cultural group while being heavy-set. As far as “numbers” that prove Black females are not as active in the gym or on running trails? I have none, but have observed the problem for a very long time both inside gyms and on the runnign trails. The numbers of Black female joggers and gym members are much lower than White/Asian female (and I am referring to urban areas where Blacks are a large minority or even majority- not rural or suburban areas). The good news is: I moved from Philadelphia to Atlanta a few years ago and found that Black female presence is MUCH higher on the run trails and in the gyms down here. Aside from the obscenely racist and moronic comments I get – those are my faaaaavorite – I occasionally get these. These…. uh…. comments. From obviously informed people. I hate these comments, and I’m going to tell you why. There was a long period of time over the first few years of the Obama presidency where there was this onslaught of media coverage about the perils of black women. We were overweight and proud to be as much, this shameful lot, and therefore unworthy of marriage… thusly, our unmarried status – and, by extension, our abundance of out-of-wedlock children were all our fault. This was the message largely perpetuated by media outlets desperate to keep the clicks coming, and nothing motivates a crowd more than angry clicks, amirite? And, when we saw these media reports, we – as black women – were hurt, no doubt, but also disgusted. A lot of us took that message and internalized it in a way that made us believe we were the problem, therefore the solution lied within us, as well. This is my seventh year in writing A Black Girl’s Guide to Weight Loss. What started out as a space for me to dump the things I’d learned on my weight loss journey as a newbie turned into a space where I opined on health and fitness matters as a certified professional, and is now morphing into a space where I do both at the same time as I begin my journey to losing the post-pregnancy weight. I’ve been on both ends of the spectrum, and I’ve written for both ends of the spectrum and all the spaces in-between. Suffice to say, this is what I do. Mind you, my Facebook page alone – not for a group, not for a “theme,” but my Facebook page that only represents me and my writing – was approaching 100,000 at the time… so, I ask him. Maybe you push an aesthetic on them that they resist? Maybe you are the kind of trainer who deals shame to a group of women already overwhelmed with the shame the rest of society tries to put on them? Hell – when you’re dealing with media that tries to pin the downfall of your community on you instead of where it rightfully belongs, the last thing you want is to pay to participate in a class led by someone who doesn’t respect you as a human being… and do so for fun. Don’t let the media reports fool you – black women are working out. A generic arbitrary number masquerading as a “legitimate measure of health” with regard to black women tells you nothing. A glimpse into an urban epicenter tells you nothing. You are looking at people, not representatives of black womanhood. I don’t represent anyone else, and they most certainly couldn’t represent me, nor should they be tasked with the responsibility. If I can look at Kirstie Alley without presuming that she represent all white women, surely, white America can do the same for black women. What you see when you enter your little non-diverse gym doesn’t erase what I see, as a trainer, when I travel and teach classes and talk to these women as they embark on their journeys; it doesn’t erase the countless e-mails I get from black women across the globe looking for insight into their weight loss endeavors. These women are training at home with DVDs and training plans they’ve gotten from their trainers (or their favorite fitness blog), because they work long hours and have children to pick up and dinners to cook and can’t afford the gym with the kid’s club in the middle. Or, they’re up in the park at 7AM for that early morning 3-day-a-week boot camp class with their little crew and their teacher, because the communal aspect of fitness keeps them all going. Or they’re getting up at 6AM to jog around their block a few times because, despite the fact that they might not live on the safest block, 6AM is still the safest hour of the day and, quite honestly, working out in the comfort of their own neighborhood – those neighborhoods that the people often making these criticisms never visit, unsurprisingly – is far better than traveling to the less diverse – yet, safer – neighborhoods and offering themselves up as a side show for people to stare, point and laugh at, or any other behavior to make them uncomfortable. @staceyNYCDC @bgg2wl to jump off a bridge for wearing a size 10 or 12 but fat gets mocked pretty hard. We’re out there every day. And just because we don’t look the way you think we should look doesn’t mean you get to erase our commitment or our dedication. White and Asian women are shamed from early youth when we show signs of being overweight and as we (I am White) get older, our ability to attract men is more restricted and our self-esteem lowers. In Black and Latina culture, there is not the same level of body shaming. I cannot stress enough – shame should never be a motivator for self-care. This person believes the culprit is too much body acceptance. Too much comfort with their bodies. That’s what’s keeping them from eating healthily and working out. If we shamed them more and made them feel worse about their bodies, then we could get somewhere with making them lose weight. …why are you talking about them and their bodies at all? It’s also worth noting that this person assumes that there’s not the same level of body shaming because of course, if there was, the women in those cultures wouldn’t be fat anymore, got it? I don’t know about you, but I received my fair share — in fact, I received enough for both me and you — of body shame growing up. You know why it didn’t result in a skinny body? Because the shame I felt about being unable to “control my body” only pushed me further into bingeing on food in a dangerously unhealthy fashion. That shame didn’t leave me until I had the temerity, well into adulthood, to say that the opinions of people I love didn’t matter since they couldn’t be bothered to say those opinions to me in a way that respected me as a human being. And, of all the women I know who spent their entire lives overweight back through childhood? Not once have I ever heard one say they didn’t have a shovel-full of shame heaped on them because of their size. Not once. We won’t even get into the nonsense of dating being easier when you’re black and fat. Listen. This is narcissism. The idea that you can spot “different” and, instead of respecting it for what it is, choosing to say “I am the standard, so you must be the problem?” The world does not revolve around any of us. The idea that what’s in front of us is all we need to define the world around us is ludicrous – if you were looking for me on a running trail, you’d never find me because I don’t find running in parks or on trails safe. I like the confines of four walls or a busy and well-populated street to keep me safe. If you were looking for many of the women who follow my blog, you might never see them because you’re too busy assuming they must not work out because they’re heavier than you think they should be. And here’s my beef – why do these people come to a website obviously supported by hundreds of thousands of women, the overwhelming majority of whom are black, to talk about how black women don’t do… the thing that the website is centered around? Why does the anecdote of one woman override the existence of hundreds of thousands of black women in one community centered around one goal? Why is this okay? Sigh. Let’s put this to bed for once and for all. I know this, not only because of what I do for a living, but because this is what you learn when you are capable of displaying empathy for another group of people… something far too many people refuse to do for black women. @bgg2wl TYVM. My head hurts after trying to find the sense in that comment you tweeted tonight. In closing, please stop telling me that black women don’t work out. In fact, stop saying it altogether. Just because they’re not in your face showing off, or feeling just as lowly about themselves as the rest of society, doesn’t mean they need to be shamed, embarrassed, or demeaned in any way. No one deserves that, but to actively acknowledge it as a tool to manipulate and control should give all of us pause. And we all deserve better than that. Erika, you are so AWESOME!! Thank you for writing this! I thoroughly enjoyed reading it and it is SO true! 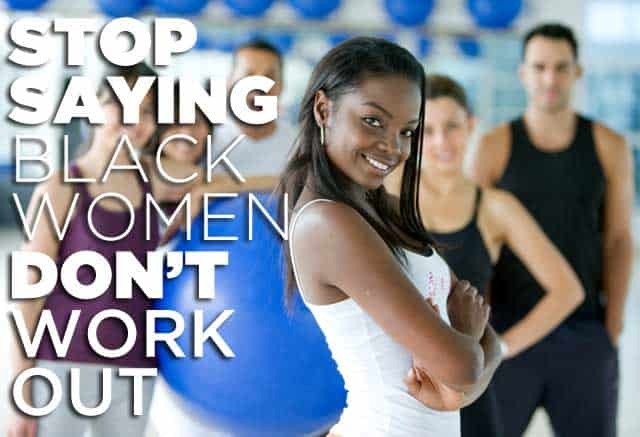 I didn’t know that “Black women don’t work out” – at least not until I moved to this USA from Jamaica where the population is predominantly black. I gotta tell you, we work out – not always in the traditional sense (such as going to the gym) But we do. We walk, run, hike and lift heavy things. And yes, I have noticed that I am 1 of about 5 black women in my crossfit box, but for me to assume that my sisters are not getting their workout elsewhere is LUDICROUS. If we don’t do things in the same way that the white, mainstream does then we are invisible. The minute she said “well I dont have any” in regards to the stats on her asinine claim, I tuned her out. Excellent work here debunking yet another myth damaging black women! Thank you so much for this article. It is definitely true. I am Black and all of the Black friends that I have work out and eat well. I am also a a Black Girls Run member and we are not just walking or running, but hiking, taking classes at the gym and weight lifting. That trainer needs to get with it…totally. I was so annoyed. Can’t we just run because we want to? I’m 65 and have been exercising for about 25 years. Sometimes I belong to a gym and other times I exercise on my own. Right now I walk outdoors, workout to exercise videos, I have about 20, and ride my recumbent bike. How I exercise depends on how I feel, time of year, and the weather. I always assume that other women vary exercise to match their lifestyles. Black women definitely exercise.